In this enlightening book you will find three approaches for transforming your dwelling into an environment for spiritual renewal and inner peace. Start reading Feng Shui for the Soul on your Kindle in under a minute. More in-depth than just placing an elephant with an uplifted trunk in the corner, which is what I wanted. Denise Linn is an expert at so many things, clearing the soul is one of them. I like how she goes beyond regular feng shui, which can have so many rules and restrictions. She puts it simply - "if it feels right, it is good feng shui". Sometimes your soul knows best, even over the field's experts. Denise gives us permission to listen to our own souls. She goes beyond the physical aspects of feng shui. Sometimes the subconscious mind can block feng shui cures. For instance, a client had an issue with rules, so no matter how "correctly" she did feng shui, it was of no use. Her client's own soul was rebelling until her soul could listen to her own intuition. Once the client implemented some insights, her life fell into place. There are simple meditations that you can do to free your own subconscious, to get your own answers. Denise is very generous. I've listened to Denise on Hay House on and off for years, and she's always been consistent. She empowers her audience to do the work themselves. Denise is not out to capitalize on others. She says if you don't have the money to hire an expert, you can do the work yourself. She's honest, real, and straightforward. What's not to love? Package came as expected. Denise Linn is well known for her books on Feng Shui, but this book is an in-depth study of the meaning of color, placement, and all of the effects of placement. Very good information for the aspiring Interior decorator, as well as the home owner. Lots of great tips in this. It's a spiritual guide to cleansing your home and creating a spiritually uplifting environment. I'm still reading this but I definitely feel more connected to my home when following her techniques. She has a lovely positive way of writing. There's plenty of information and much of it involves interacting with your home and connecting to the energy of your home and your self. 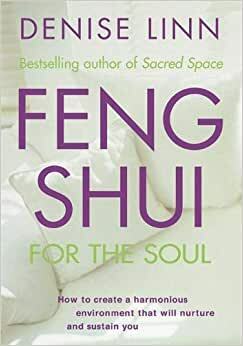 This book is not just a discussion on feng shui but a personal guide and will leave you feeling grounded, uplifted , and plenty of ideas on how to clear your space wherever that may be. Yes, this was one of those books that found their way into my hands and the page that I read was "me"!! It was sooooo ME! I just had to get the book, I believed it would have the answers to my dilemma! It did. It does and I've been sharing and passing on this book to anyone who is interested in Feng Shui since. It even inspired me to seek out more Feng Shui information and ultimately take a course in studying it. Today, I practice for friends and "trade" but not as an actual business. We already have a home business that is taking off beautifully. Whenever I apply the Feng Shui techniques, business improves! Marvelous. Insightful. My "bible" of Feng Shui guidance. Truly helpful. Oh, and Denise Linn has a radio show on Hay House every week. I listen whenever I can. She's got great insight. I truly enjoy her!